The Prince of Wales will be helping to mark the 150th anniversary of one of London’s (and the Victorian era’s) defining civil engineering works, Joseph Bazalgette’s sewerage system, improvements to which are still underway. The Romans may not have had a fully scientific understanding of bacterial infection but that didn’t stop them thinking that sewerage might be a good idea. They are credited with constructing their first sewage system in Rome between 800 and 735BC, a public works likely to have improved the health of its inhabitants as well as bringing relief to their olfactory systems. Skip forward to London in 1858 and further offences against the sense of smell in the form of the ‘Great Stink’, a situation that prompted Parliament to push through a Bill that would see Sir Joseph Bazalgette deliver one of Britain’s most ambitious and enduring engineering projects. Sir Joseph’s 900km sewage network was designed for a city with a population of two million and was opened by Prince Charles’ great-great grandfather Edward, Prince of Wales (later King Edward VII) in 1865. 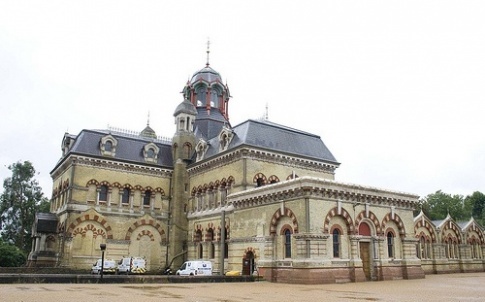 This Wednesday Prince Charles is set to visit the Lee Valley Tunnel and Abbey Mills Pumping Station (pictured) to mark the 150th anniversary of Sir Joseph’s sewer network. The growth of London puts inevitable strain on its infrastructure, with notable tunnelling projects by National Grid and Crossrail helping with projects designed to anticipate the requirement for energy and transport services. Coinciding with Prince Charles’ visit is a celebration of the completion of tunnelling work on the £635m Lee Tunnel, the deepest ever constructed under London and an essential element of Thames Water’s long-term strategy to clean-up the River Thames. London’s population currently hovers around the 8.5 million mark and each year, around 39 million tonnes of untreated sewage mixed with rainwater is discharged into the river from overloaded treatment works and combined sewer overflows. Thames Water’s solution is built around three major schemes: a virtually complete £675m programme to upgrade its five main sewage works (Beckton, Crossness, Deephams, Riverside and Long Reach), the £4.2bn Thames Tideway Tunnel and Lee Tunnel, which runs seven kilometres from Abbey Mills to Beckton, is 75m deep and set to be in operation by December. The Prince of Wales is president of WaterAid, Thames Water’s principal charity, which is asking the public to help tell the story of how clean water changed Britain over the centuries, and is marking 2015 with its Big History Project. It needed the “Great Stink” to force MPs to act on public investment in essential infrastructure. Will we have to wait for the Great Flood of London to breach sea defences, before they’ll actually do anything besides talk about global warming? Prompted by the coming election, no doubt. They’ll carry on business as usual, whoever wins. 2000 years ago the Romans and 150 years ago the Victorians didn’t have biodegradable plastic bags or “non stick” surfaces (see recent article in “The Engineer”) so they needed the “water closet” to flush away their wastes with water. In earlier times hygiene was assured for some by “night soil” being collected for disposal/recycling. But only those who could afford this collection service used it. Those who could not afford it used other cheaper and less hygienic means of disposal resulting in poor sanitation and health problems. And this situation continues in many parts of the world today where millions of people suffer from unsanitary conditions as installing water flushed toilets and sewers and sewage treatment infrastructure based on our Victorian model is prohibitively expensive. But what is so wonderful about our existing system of human waste disposal? Huge volumes of water have to be treated to drinking water quality standard at high cost and then pumped with high energy consumption before being used to flush human wastes to a vast high maintenance network of sewers and pumping stations in order simply to transport the wastes to treatment plants where the solids then have to be separated from the now contaminated water, the solid wastes thickened and the resulting sludge processed and the waste waters treated y to safe disposal standards before disposal to rivers or the sea at enormous cost. Waterless toilets are now available and are in use in many parts of the world. These provide a hygienic means of capturing the concentrated waste materials at source for collection in the same way that children’s and old people’s nappies and sanitary material and dog wastes are collected by waste management service providers today. The bagged waste can then be delivered directly to anaerobic treatment plants for recovery of energy and high grade compost and other valuable constituent materials. So lets spend some time and money on designing and installing sustainable water-less toilets rather than copying the Victorians and digging tunnels and holes in the ground and upsetting Jeremy Clarkson (See Sunday Times 15th Feb). Can’t but help think engineering is not doing us any real favours here. Be a lot better to prevent the ever increasing population, its only a better of time before something will give – engineering is just being delaying the inevitable!